“A polarimeter is an instrument often used in chemistry to determine the concentration or purity of specific substances, like sugars or organic acids. Basically a light beam is -linearly- polarized by passing through a polarizer (filter sheet, crystal, mirror) after which the light propagates in one plane. When this light passes through an optically active substance, this plane rotates depending on the substance, it’s concentration, the temperature, the wavelength and length of the path through the medium. The amount of rotation can be measured with the analyzer, which is just another polarizer that can be rotated to return to a maximum or minimum intensity of light, as shown in image 2 (“analysis with polarized light”). The capability to turn the plane of polarized light is characteristic for each substance and is listed as “specific rotation”. Image 3 (“specific rotation and usage”) shows the related formulas and gives an example. 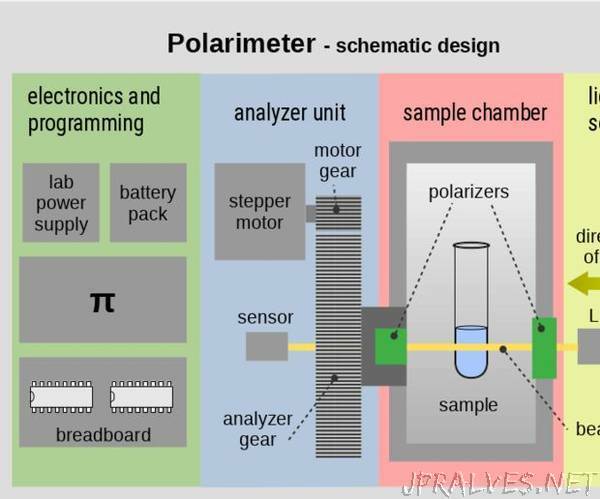 You can find much more information on polarimetry, polarimeter and optical activity in the internet. In this project I built a polarimeter with a reproducible precision of +-0.03 (please see the last step for a comment on this). Image 1 shows the schematic design.